Everyone, it seems, has a 2CV story. Even James Bond used one as an escape vehicle (admittedly only when his Lotus exploded). As a child of 1970s Bristol, my 2CV associations are less 007, and more my friend’s bohemian parents parked up at the allotment complete with obligatory Nuclear Power No Thanks sticker on the bumper. Conversely, our own family-of-five transport was a mustard-brown Mini Clubman, so the 2CV, with its sunny primary colours and fold-back roof represented an alternative world of motoring – a tantalising vision of freewheeling Euro-fun. So, where better to celebrate the 2CV’s 70th birthday than its homeland? And for a car that was designed to carry ‘four people and 50kg of potatoes’ the rural interior of southwest France provides a fitting destination for our road trip. The circular route begins and ends in the picturesque riverside village of Aubeterre-sur-Dronne, and over the next week will lead us through the vineyards, forests and rolling hills of Cognac country on a network of backroads and single-track lanes, taking in the Dordogne, Limousin and the Poitou-Charentes regions. But before we hit the road, we are given a formal introduction to La Petite Grise, as our motor has been christened by Marianne, an energetic Dutch expat who spied a gap in the market, and set up 2CV hire company, Tour de Canard. Describing it as a ‘hobby that got out of hand’, she now has a small fleet – and bookings rolling in from fun-seekers across the globe. Marianne combines the pride of a ship’s captain with the devotion of a dog-owner as she shows us around the car, referring to it as ‘she’ and administering affectionate pats and strokes. She demonstrates the controls. It takes all of sixty seconds. There are cute flip-up windows and rolling back the soft-top involves string. ‘And this is the air-conditioning’, she announces, deadpan, twisting a chunky metal knob. A hinged vent creaks open to reveal a strip of wire mesh above the dashboard. For a car that was designed to carry ‘four people and 50kg of potatoes’ the rural interior of southwest France provides a fitting destination for our road trip. And then we are on the move, crunching through the gears and living the Gallic dream that has enticed so many Brits across la Manche over the years. All we’re missing is a baguette poking out of the roof. Spiritually and sensually, the Deux-Chevaux connects us to our surroundings in a way that no other car could quite manage. 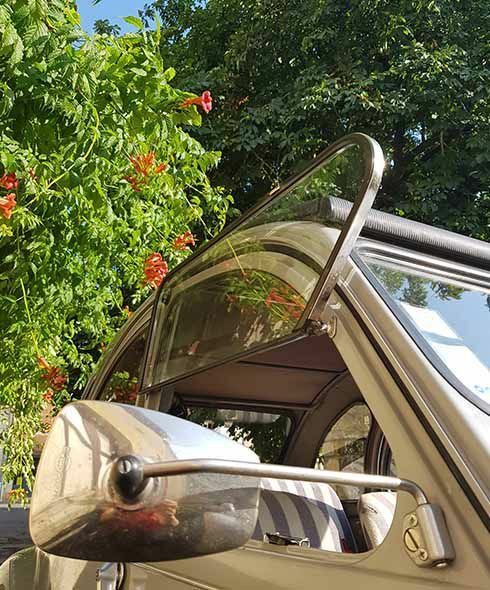 More akin to a motorcycle ride than a modern car journey, steamy hot air blasts us via the windows, the roof and the ‘AC’, leaving us in no doubt to the outside temperature and deliciously aware of fleeting wafts of jasmine, lavender and village boulangeries. As we head east the next morning the sense of time travel is heightened, not just by our vintage driving experience but the sensation that we are plunging deep into old France. 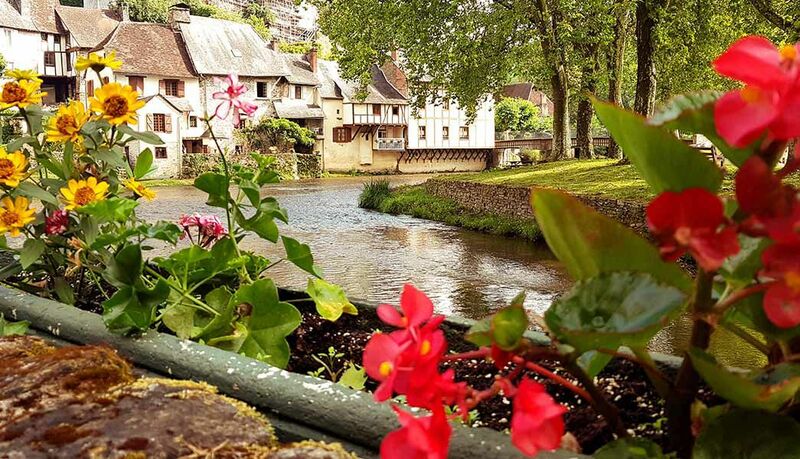 There is not a city for miles, or even a town with anything to remind us of the modern world – no billboards or global chains, just sleepy village cafes hosting old men with their Gauloise and tiny coffee cups. But woe betide the 21st century traveller who tries to get lunch after 2pm. The 24/7 culture of London is hard to shake off and we invariably end up hungry at all the wrong times, gazing forlornly at FERMḖ signs on restaurant and shop doors. My husband points out that at least we might lose weight on this trip. Our survival situation is heightened further upon arrival at the exquisite medieval village of Ségur-le-Château where we will stay for two nights. Just as we are settling into our 14th century house, the entire village’s power supply and mobile phone signal is knocked out by a storm. We batten down the hatches as the wind shrieks, trees shake, windows rattle and the frontage’s wisteria is torn to the ground, blocking the front door. By candlelight we raid the kitchen cupboards and find a tin of lentils, and thank heavens, two bottles of wine. The 24/7 culture of London is hard to shake off and we invariably end up hungry at all the wrong times, gazing forlornly at FERMḖ signs on restaurant and shop doors. As night falls, the storm subsides and we hack our way out through the ravaged wisteria into the village, hoping vainly for a restaurant holding out against the power cut. But all the lights are out and the only sign of life is a few flickering candles in the village bar. We venture in with much excitement, imagining the locals gathered around the piano, signing chansons and bonding in blackout bonhomie. But their response is less Blitz spirit, more Gallic shrug. There is no food. But there is wine. There is always wine. The morning brings the sun – and the roof is rolled back once more. We leave Ségur-le-Château, still without power and enjoy an improvised zig-zag journey dodging numerous RUE BARRE signs where fallen trees and telegraph poles have crushed barns and cut off villages. The phone signal is still out and we are thankful for our analogue approach to navigation. Our trusty ring-bound French road atlas saves the day and steers us west towards Cognac with its flower-filled boulevards and grand buildings of the Hennessy distillery dominating the river bank. Bathed in the glory of post-storm sunshine, fields of sunflowers, lavender and grapevines make for a dreamy, multi-coloured backdrop to our last few days. 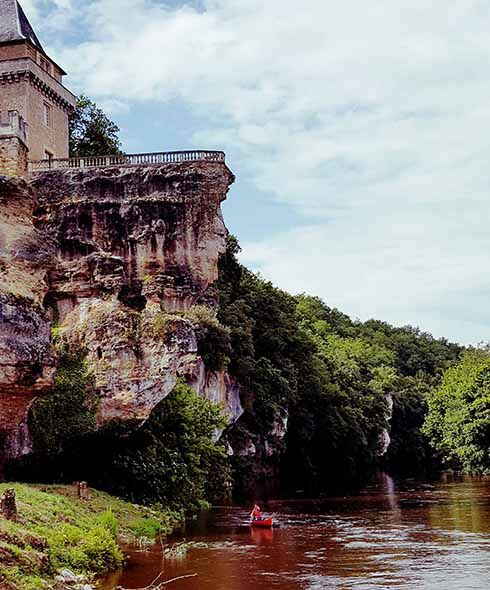 We swap our two horsepower for even slower transport – a canoe trip along the Saint-Léon-sur-Vézère, where we pass through gorges with fairy-tale chateaux perched high above us, and eventually drift into the riverside village of Saint-Léon-sur-Vézère. True to form, we arrive during the food twilight zone but thankfully some enterprising sort has realised the demand for all day dining and we are rewarded with a huge and sumptuous goat cheese salad, drizzled with local honey and scattered with walnuts. Our last morning is spent where we began, in Aubeterre, soaking up the Sunday lunchtime buzz of the village square with its cafes and market stalls, browsing the brocante and inhaling home-grown fragrances of local cheeses and soaps before we make our final drive down the hill, across a bumpy meadow to the riverbank, finding the 2CV as competent off-road as on. The car’s original design was made with farmers in mind, bestowing it with surprisingly capable suspension – apparently a basket of eggs in the boot had to be able to survive a drive across a ploughed field. We jump out of the car and straight into the cooling green waters of La Dronne, looking back from the river at our trusty ride parked up under a weeping willow. It really is the ultimate 2CV moment – and we don’t want it to ever end. 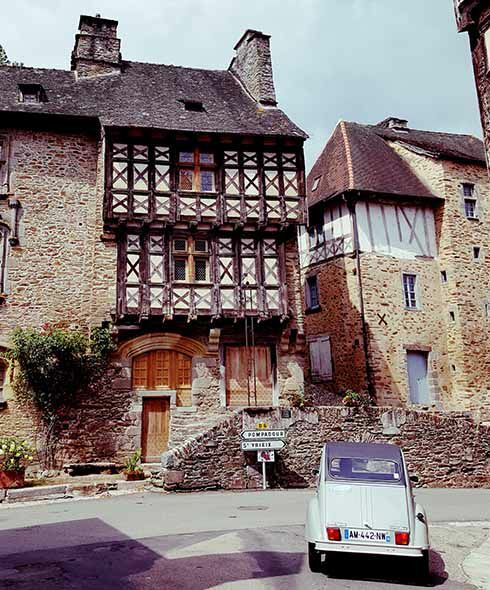 Lois flew into Bordeaux and picked up her 2CV from Tour de Canard in Aubeterre-sur-Dronne. She then spent night one at Le Logis La Montagne. From Allemans, Lois drove to the village of Ségur-le-Château (approx 1hr 40 mins). She then stayed for two nights at Les Figues. The next day, she visited Saint-Léon-sur-Vézère (drive 1 hr approx) and went canoeing down the river. Then, returned to Ségur-le-Château for another night’s stay. From Segur le Chateau she drove through the Perigord-Limousin Regional Natural Park to Le Bourg in Charentes (2 hr 20 mins approx). After dropping her bags off, Lois drove into Cognac for a distillery tour at Hennessy (20 mins approx). After, Lois headed to Jonzac and then onto Chez Vallee in Charente-Maritime. Where she stayed for her final night. On her final morning, Lois drove to Aubeterre-sur-Dronne (1 hr approx) and explored for the day. Before dropping the 2CV back to Tour de Canard and catching a flight home to London.